1. If you wish to cancel or change your reservation, we will require 7 days advance notice before the date of your arrival, otherwise you will be charged the cancellation fee of one night's stay. Cancellations made with 7 days advance notice or more will not be charged. 2. If you fail to check in as scheduled, we will cancel all your bookings and you will be charged the cancellation fee. 3. During your stay, we also require 7 days advance notice, should you want to change the duration of your stay. As long as you notify us 7 days before, we will refund the fee you have already paid. Please do NOT occupy common spaces with your group otherwise other individual travelers can NOT use there comfortably. 1. Persons under 17 years old can not be stayed without their parents or teacher. 2. Children under 12 years of age may not stay in the Dormitory rooms, even if they stay with their parents or teacher in the same room (They can only stay in private rooms with their parents or teacher). The following group types are not accepted by this hostel: Holiday with Friends, College / University, Business Trip, Stag/Hen/Bachelor Party, Cultural Group If you have misrepresented the type of group you are booking for, your booking may be cancelled by the hostel." If you have Japan Rail Pass, the train to Ajikawaguchi Sta is covered by it! It's very convenient to go out to the city center. 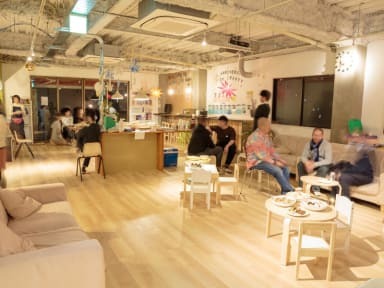 In J-Hoppers Osaka Universal, there are Wi-Fi throughout the hostel, shared PCs available and a communal kitchen which is fitted with a microwave, toaster, coffee maker, rice cooker, cooking utensils and tableware. Free coffee, tea, Japanese tea and various kinds of seasoning are available to use. 24hr bathrooms include soap and shampoo. There is a hi-tech toilet and lavatory with hair dryers on each floor. Dorm bed is a quite large sized loft bed included enough space to put your luggage. Equipped with a personal reading light, plug outlet and curtain. Type A : JPN style room with 2 loft beds, which is better suited for 4 persons guests. Type B : JPN style room with a loft bed, which is better suited for 3 persons guests. Even when booking into smaller groups does not exempt that party of the 12 or more rule. In which case, we can not guarantee a reservation will be kept. A group of over 4 persons can not be stayed in a same dormitory room. Should a child share a bed with an adult, we do not charge accommodation fees for them, should they use a separate bed, we charge the same accomodation fee as an adult. Children under 12 years of age may not stay in the Dormitory, even if they stay with their parents in the same room. We do not accept a booking without an adult. If you are at least 16 years of age and want to stay by yourself without an adult, we require that you submit a consent document in advance. Persons 18 and older are considered adults. 1. If you wish to cancel or change your reservation, we will require 2 days advance notice before the date of your arrival (e.g. if your arrival date is on the 5th, cancellation should be on the 3rd before 10pm Japan time), otherwise you will be charged the cancellation fee of one night's stay. Cancellations made with two days advance notice or more will not be charged. 3. During your stay, we also require two days advance notice, should you want to change the duration of your stay. As long as you notify us two days before, we will refund the fee you have already paid. 4.For groups of 5 or more people, we may require additional condition when you make a reservation. 2. Check-in time 15:00 to 22:00 / Check-out time 8:00 to 11:00 / Reception hours : 8:00-14:00 & 15:00-22:00. In case you arrive from 22:00 onward, please let us know in advance. We have no curfew and lockout. 3. We take no responsibility for the loss or damage of guest’s belongings regardless if it is in a private room, dorm room or common space including the luggage storage. 5. We must be notified immediately of any loss or damage to our property. Guests will be charged reasonably for any repair or replacement of any property loss,removal or damage. 6. We will keep an unclaimed lost article for 3 months after you check out. After that we dispose of them. 7. Smoking is not allowed inside of the building. (Outside entrance is allowed) If there is any evidence to suggest you have been smoking. i.e. setting off smoke detectors or leaving cigarette remains(ash,butts,burn marks.) you will be removed from the premises. Our stay in this hostel was AMAZING! Very convenient, pleasant environment and very clean. Staff very helpful and kind. Highly recommended. This hostel is at the top of the list! It is located in a quiet area and is super close to the station. You could walk to Universal if you wanted to (~20 min). The facilities are very clean and there is so much space in the bed area, which includes curtains for your own privacy. The staff were so friendly and welcoming! I love that they were open to talk about different things! They would also play movies on the projector, such as, Fantastic Beast and Minions. I would definitely come back! Had a great time here! Bunks are huge and very private. Beds are japanese style but more comfortable than the other ones I slept on. Super close to universal (1 stop on JR line). Very clean facilities and staff was super nice and friendly. Very nice staff, very clean facilities. Very nice service. I left one of my souvenir there while I already back in my country, and they are willing to send it here. Definitely will stay there again. The best staff between the best, they were really concerned to help me figuring out what to do and the best way to do it. The main attraction close to them is universal studios, but this doesn’t mean you can’t get to other places because they are just 3 minutes walk from a train station where you can take a train and get wherever you want. If you are planning to go on weekend, be sure they have rooms available, because they use to be full because of the people who are planning go to universal. While the stay was overall good, I have to give a low score on all counts because the hostel illegally asked for information regarding my party (me and a friend). We are legal residences of Japan and therefore have residence cards (zairyu cards). Under Japanese law, only guests without Japanese addresses (guests who do not have legal residency in Japan) are mandated to show identification (passports). Those with legal Japanese addresses are under not obligated to show ID. Please follow the law.